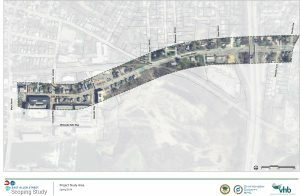 The East Allen Street Scoping Study advances the planning efforts for the East Allen Street corridor undertaken as part of the Winooski Transportation Master Plan and the Winooski Gateway Corridors Form Based Code. 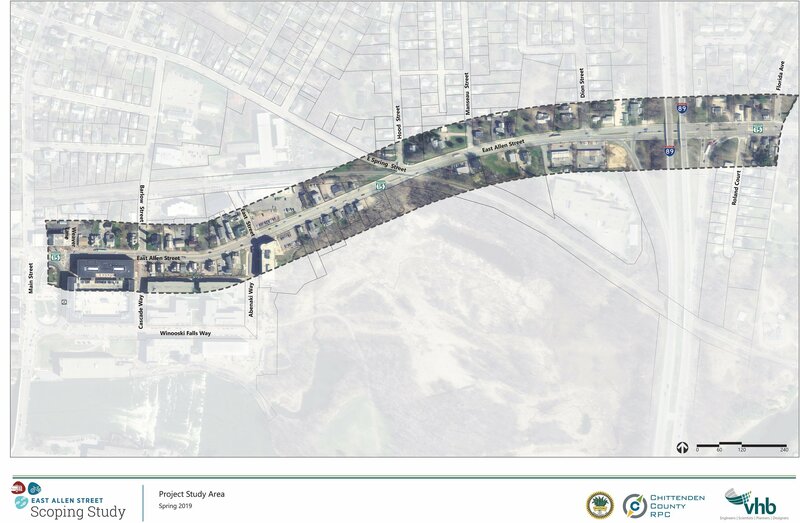 These planning efforts offered a vision for increased safety and mobility for all roadway users, improved streetscape amenities, and enhanced economic development opportunities along the major gateway corridors in Winooski. East Allen Street carries over 18,000 vehicles per day in some locations, making this a major connection in the both the Winooski and regional transportation network, as well as serving as one of the main gateways into Winooski. This study seeks to identify a package of technically feasible and locally-supported improvements that enhance safety and accessibility for all modes, improve overall aesthetics, and maximize gateway development and redevelopment opportunities along East Allen Street. The study area runs along East Allen Street (VT Route 15) from the Winooski Downtown Circulator east approximately 3,700 feet to Roland Court which is immediately east of the Interstate 89 Exit 15 interchange. In order to accomplish these goals, the East Allen Street Gateway Enhancements Study will be led by an Advisory Committee and will include three public meetings. An introduction to the project process and an opportunity for the public to voice their input on safety and mobility along East Allen Street. Presentation of project goals and Draft Purpose and Need Statement. Review sketches of potential improvements and their performance. Workshop for attendees to comment on proposed improvements and suggest changes. The role of the Advisory Committee is to represent a range of perspectives; review study materials and provide feedback; communicate with and provide updates to their organizations/constituents; and participate in developing the purpose and need statement, alternatives, and recommendations. Ultimately, the City Council will consider and endorse the final design recommendations of the Study. Overview of the study, solicit feedback on study goals, strategies, issues, and opportunities. Overview of alternatives evaluation, solicit feedback on the options presented. For more information, please contact Jason Charest, CCRPC Senior Transportation Planning Engineer, at (802) 846-4490 x *32.